← Yes, We Have A Mascot! Aren’t everyone’s blocks stunning? (If you click on the picture, you should be able to see it a bit bigger). Rows A-H are sewn together, with spaces left for a few soon-to-come blocks. I got five more blocks this evening, and will post photos of them over the weekend. Hoping to get another few rows sewn up this weekend and maybe the rest done by end of the week. For those of you still working on a block or two, please please please let me know if I can pick them up from you or at City Quilter in the coming week. 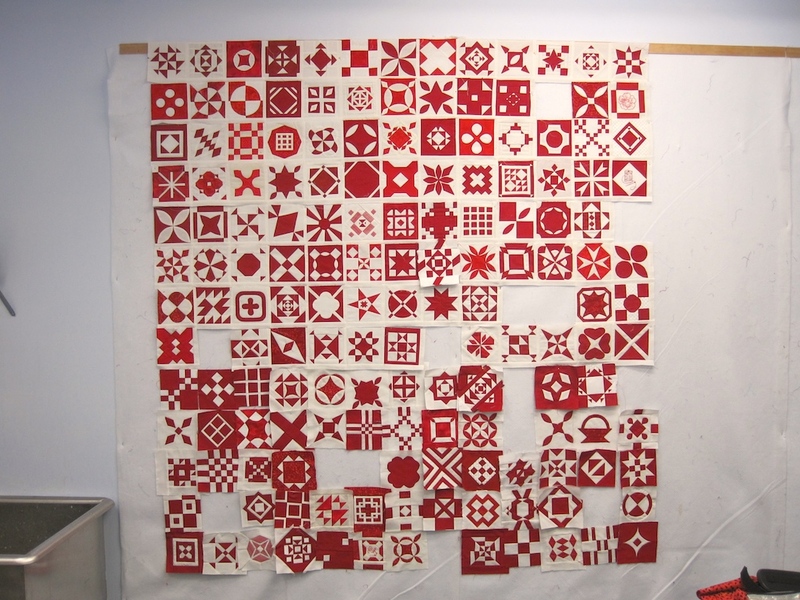 Will be at the Empire Quilters guild meeting tomorrow afternoon to see the red-and-white challenge project (how could one miss it?). My first guild meeting ever (shameful, but true) and I’m looking forward to it.